I'm really excited about what I'm sharing with you today. A friend showed me last year how to make bookmarks using leather string, beads and charms. It got me thinking, why can't you do something similar with ribbon and parts from the Pretties Kit? You can! 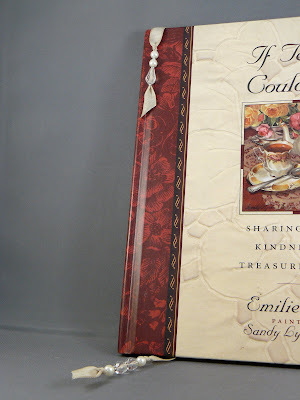 I started with a 20 inch piece of Kraft Taffeta ribbon (the finished bookmark is 11 inches for the spine area of the book) and knotted each end to leave room for the book spine. You need to cut the ribbon at a sharp point in order to thread all the beads through. Then, just decide your pattern and knot and slide beads. Here's a picture of just the bookmark. These would make great last-minute gifts for Christmas and only took a few minutes to assemble.